DJI is notorious for their drone collection, the Phantoms, that are popular within the industry. 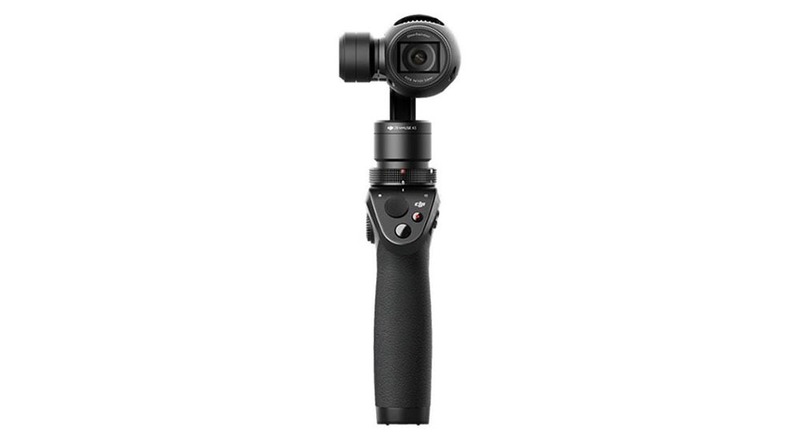 Back in 2015, the company decided to take another route and experiment with a different type of gear – a handheld gimbal and camera mount, the DJI Osmo. It definitely turned heads as it was something out of the ordinary from what consumers usually expect from DJI. The Osmo allows consumers to capture the world right from their fingertips instead from the usually aerial viewpoints. It is not like any other camera as its special qualities and features will make you feel like you are reliving each moment first-hand. But with many cameras, there is the good and the bad. Lucky enough, we are here to dissect what makes the DJI Osmo as unique as it is claimed to be. At just 7.1 ounces, the Osmo is easy to hold and maneuver especially for those planning to use it for extended shoots. There are four parts to the Osmo: a camera that is attached to the Zenmuse X3 three-axis gimbal, the handle with all the control buttons, the battery, and the phone clamp. At first, you will notice the gimbal does not move as it comes locked when not in use. This is extremely convenient as it won’t move around when packed and you won’t have to worry about it breaking easily. But the package itself already includes lens cap, wrist strap, and a small carrying case. You will notice that the Osmo has no screen. If you want to see what the Osmo is capturing, you will need to use your smartphone and connect via Wi-Fi. The only issue is the clamp only holds phones up to 5.5 inches. In order to get a hold of the control settings, you will have to download the DJI Go app. This will allow you to adjust the video settings, adjust the gimbal behavior, and set your exposure. If you have used DJI’s Inspire 1 then you will be familiar with the quality of the camera. 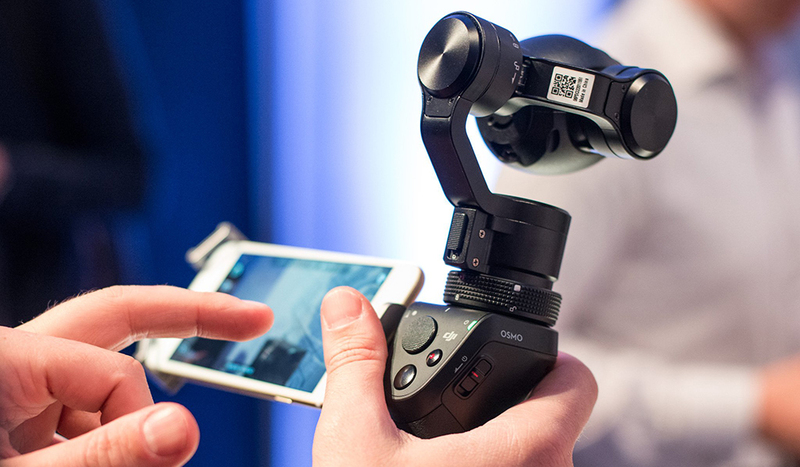 The Osmo uses the Zenmuse X3 camera which has the same lens and sensor as the Inspire 1. Although, it is built a bit differently since it is catered for a gimbal hardware. To those who already own the Inspire 1, you can use its camera on the Osmo handle as it also sold without a camera. The Osmo captures the same type of footage as the Inspire 1, a wide-angle, 20mm (full-frame) view. When it comes to getting aerial views, this is a perfect setup for a camera but when on the ground, the wide view is not always ideal. One of the main issues with the camera is its ability to focus. DJI mentioned that the lens only focuses crisply on objects that are about 5 feet or further. Anything closer, the lens cannot focus on it. When it comes to the video quality, it is worth the coin. Videos save at a 60Mbps bit rate, with cinema 4K with 24fps and the more popular UHD 4K with either 30 or 24fps. You can also shoot at 2.7K with 30 or 24fps. To those who want a faster frame rate, you can shoot at 1080p with 24, 30, 48, 60, or 120fps. So there is definitely a wide variety of footage modes you can choose from with the Osmo. When it comes to stills, they are recorded at 12-megapixels in both Raw and JPG formats. When it comes to battery life, DJI could have done a bit better. The company states that the Osmo lasts about an hour but in reality, it goes for about 40 minutes – this is with a fully charged battery and putting the Osmo to sleep when not in use. If you intend on buying extra chargers, each one goes for $35. Something else to consider is the battery drainage the DJI app has on your smartphone. It tends to have a strong impact on a smartphone’s battery life as it drains quickly. Simply playing with the Osmo for a few minutes can take your phone from a full charge down to about 35 percent. Another feature DJI should have worked a bit more on with the Osmo is the audio. The internal mic is not the best and if you are a professional videographer, you would not even think twice of using the mic. Since the Osmo has a fan built inside to keep it cool, it is an audible distraction to whatever you will try to record. When it comes to the soundtrack, it is also quite low in amplitude. Of course, this might be directed to those looking to create professional work but even for casual usage, you might want to look into external microphones. The Osmo itself has a standard 3.5mm input. Just take note that you will also need to purchase a universal mount and extension arm. For a company that mainly focused on drones, DJI impressed consumers and showed that it is versatile. The Osmo proved to be a force to be reckoned with as DJI did its research and incorporated many top-notch features that were missing in other hand-held cameras. To those who are already familiar with DJI products and have some of their own, especially the Inspire 1 drone, the Osmo can be a great addition to your gear collection. As for professionals, the Osmo can be an incredible alternative if you are not looking to go towards the Steadicam. You will be able to change lenses and for the price, the camera is great. But of course, the Osmo is not perfect as there are qualities that need some tweaking. This includes a better microphone, clearer still images, and a longer battery life.